Eagles on a high: Defender Matt Swanson in action for Somerville Eagles. Picture: John Punshon. SOMERVILLE Eagles have secured significant grants from Mornington Peninsula Shire council. The promotion-chasing State 5 club understands that the council will spend $500,000 on clubrooms at Tyabb Central Reserve while also allocating $50,000 for a feasibility study which it hopes will identify a permanent home for the Eagles. “It’s not official yet but we understand that we’ve been granted the money which is great news for our club,” president Luke Mulder said. The Tyabb Cricket Club shares the reserve and will also benefit from a clubroom upgrade. The feasibility study will centre on Clarendon Reserve in Somerville and will look at the viability of developing three pitches with clubrooms at that venue. Currently the Eagles alternate between playing home games at Tyabb Central Reserve and on a synthetic pitch at Somerville Secondary College. “It’s exciting times for the club and the local community and a great reward for the amount of hard work the committee puts in to running the club and I know how hard they have pushed to get this far,” joint senior coach Scott Morrison said. Another benefactor of a funding grant was NPL2 title contender Langwarrin who announced last week that it had secured $375,000 from the federal government’s Community Development Grants Programme. This will fund a stage 1 project to install floodlights on pitch 3 at Lawton Park and electrical upgrades to allow the as yet unfunded stage 2 which will install floodlights on the main pitch and upgrade the current floodlights on the top pitch near the entrance to the complex. The news wasn’t as positive on the main pitch last Saturday when Langy lost its NPL2 clash 1-0 against Manningham United Blues. The home side failed to clear following a long throw-in from the right in the 16th minute allowing Manningham’s Billy Romas to slam the ball home from close range. Last week Langwarrin announced the signing of defender Luke Goulding from Melbourne Victory, younger brother of senior team midfielder Callum. Luke Goulding is 18 and Langy is able to sign players from other NPL clubs outside the transfer window if they are under-20s. It’s believed that Kingston City midfielder Cooper Legrand remains firmly on Langy’s radar. The Mauritian international can’t be signed until the transfer window opens on 14 May. In State 1 news Mornington got back to winning ways when it downed Mazenod Victory 2-1 at Dallas Brooks Park last Friday night. 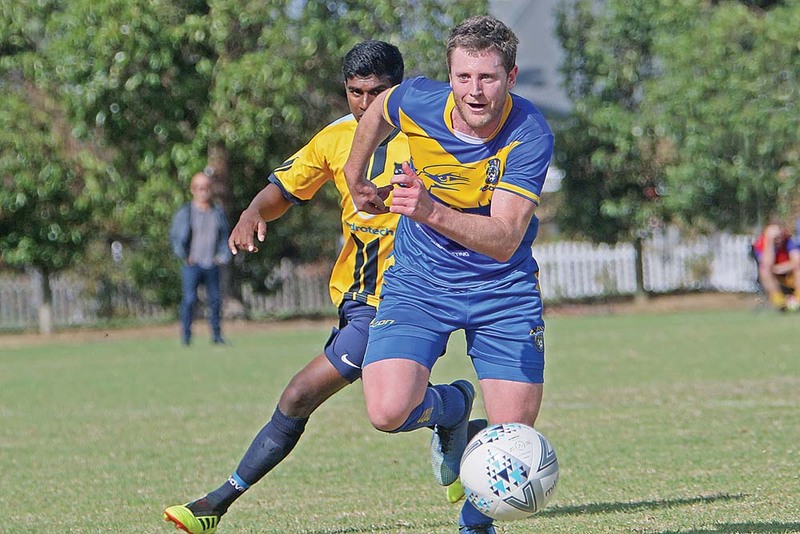 Veteran striker Nick Waite was the local hero with two goals in the opening eight minutes, the first coming after a mistimed punch from Mazenod keeper Robbie Acs in the first minute. Waite was lurking as usual at the back post and when the ball fell at his feet Mazenod’s fate was sealed. Seven minutes later Waite’s attempted through ball was cut out but he followed up and slammed home a shot from inside the area to give the home side a two-goal cushion. Amir Osmancevic could have ended Mazenod’s hopes in the first few seconds of the second half but his near post header was well parried by Acs. Mazenod scored in the 53rd minute when Rob D’Angelo’s cutback from the left was met first time by Jayson Gucciardo whose low strike gave Mornington keeper Taylor Davidson little chance. In State 2 news Peninsula Strikers went down 3-0 at home to Boroondara-Carey Eagles. The visitors were 2-0 at half-time and Lachlan Nichols’ second goal in the 72nd minute settled the issue. In State 3 news Frankston Pines received bad news last week when midfielder Cam Bryden was ruled out for the rest of the season with an ACL tear. The injury occurred during the club’s FFA Cup loss to Thornbury Athletic in early March but was initially misdiagnosed and now Bryden requires surgery. Fellow midfielder Joe O’Connor suffered a corked thigh against Whitehorse United on 6 April and could miss another fortnight. Their absence forced head coach Kevin “Squizzy” Taylor to rearrange his side for last Friday’s home clash with Collingwood City. But it was like shuffling deckchairs on the Titanic because Pines were thumped 5-0 by the ladder leader. This Pines side is a far cry from the Pines of old. Too many players wearing the club colours on Friday were non-combative and even pulled out of 50/50 challenges while some of the defending was farcical. Add this to an inability to create chances against a team that closes down well and is good on the ball and it’s a recipe for disaster. Meanwhile fellow State 3 rival Skye United lost 3-1 to Elwood City at Elwood Park on Saturday. Midfielder Mark O’Connor scored for Skye which is still searching for its first league win of the season as is neighbouring Pines. In State 4 news Baxter earned its first point of the season thanks to a 1-1 draw with fellow struggler Dingley Stars at Baxter Park last weekend. Dingley took the lead in the 38th minute when Baxter was caught on the break and Erman Sepetci raced clear before striking a low shot across Baxter keeper James Foster and in off the far post. Baxter had to wait until the 89th minute for the equaliser and it came from substitute Lewis Gibson’s well-taken penalty conversion. Much has been made of Baxter’s nightmare start to its 2019 campaign but this was a competitive and spirited display albeit against another lowly ranked outfit. Veteran defender Matt McDermott has added some steel to the side and attacks the ball with intent while Nat Daher’s second half was excellent and his eagerness to run at opponents and take them on was a highlight. Fatih Akdogan took over the senior coaching reins at Dingley last week after the club parted company with Billy Armour and Billy Rae. Harry McCartney reports that Seaford United went down 2-1 at home to Endeavour United on Saturday. A fast break from Sebastian Goyenechea in the 13th minute and a well-timed cross should have provided an easy tap in for Endeavour forward Ifeolewa Ogidan but his miscued strike eventually crossed the line despite a defender and Seaford keeper Anthony Madafferi both getting a touch. Conor Mcfall, Jack Carter, Mitch Lander and Naseer Mohammad all had shots on target for the home side only to be denied by Franc Marateo with some solid saves. Lander equalised in the 37th minute after rounding two defenders and effecting a clinical finish and the sides went in locked at 1-1 at the interval. The decider came in the 83rd minute when Madafferi parried and former Langwarrin midfielder Matt Morgan struck a firm shot which Madafferi got a hand to but only succeeded in deflecting the ball into the roof of the net. In State 5 news Aspendale Stingrays recorded their first league win under Lee Barber when they defeated Rosebud 3-1 at Olympic Park last weekend. Pal Calvino scored with a header from a corner in the 14th minute. The Stingrays dominated the first half and two goals from Kenan Nuhanovic sent them in at the break with a three-goal cushion. Rosebud’s reply came in the 85th minute after a penalty was awarded for handling and Blake Hicks converted from the spot. Aspendale’s best were Calvino, Kieran Hughes, Peter Dimopoulos and Guilherme Ribeiro. Somerville Eagles bounced back from the previous week’s reversal to beat Pakenham United 2-0 at IYU Reserve on Saturday. Ben Meiklem started on the bench after his switch from Baxter late last week. Somerville talisman Mark Pagliarulo had returned from a holiday on the Gold Coast and gave the visitors the lead in the 40th minute when he rolled his marker and smacked home a low drive. Eagles co-coach Dave Greening had chances to increase the lead but eventually they forged further ahead after good work by Meiklem set up Pagliarulo in the 72nd minute and his firm strike gave Pakenham keeper Jarrod Reynolds no chance. In NPLW news Southern United’s senior and under-19 teams both lost 10-0 to Box Hill United last weekend. Southern’s under-16s won 7-1 with goals from Rhys McKenna (4), Eden McKeown (2) and Danica Vukcevic. Vukcevic’s backheel volley was the most spectacular of the goals but an interpassing move starting from the right-back position involving five players ended with a cheeky sidefoot volley from McKenna for the best team goal of the contest. Southern’s under-14s won 2-1 with goals from Erica-Derrick Sarfo-Sarpong and Rhiannon Kelleher. In FFA Cup action a floodlight failure in the 70th minute last Wednesday forced an abandonment of Skye United’s thrilling round 5 tie away to Upfield with scores locked at 5-5. Skye’s goals came from Mitch Blake (2), Nic Miliaresis (2) and Mark O’Connor. Football Victoria has taken both clubs by surprise by scheduling the replay for Darebin tomorrow night (Tuesday). TUESDAY, 8.30pm: Upfield v Skye Utd (round 5 FFA Cup, Darebin International Sports Centre). THURSDAY, 8pm: Corio v Langwarrin (round 5 FFA Cup, Hume Reserve, North Geelong). SATURDAY, 3pm: Monash Uni v Frankston Pines (Tatterson Park pitch 3).